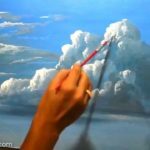 How to paint clouds like a pro. Everyone likes a blue sky with clouds. Painting clouds realistically can be challenging. We all look at clouds as children and make things out of them. It's important to paint clouds, and the shadows and clouds in order to make it landscape jump. Painting tips and tricks tutorial. 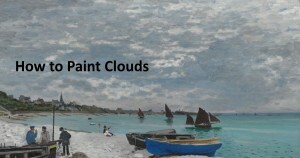 3 Tips On Painting Great Clouds in Oil or Acrylic by Tim Gagnon. How to paint Acrylic Clouds in the Sky! A basic speed painting tutorial of a cloud. #188. How to paint fluffy night clouds and moon "acrylic"
Paint an undercoat in the color of your sky, remember to blend your sky from dark at the top to very pale at the bottom. The sky usually gets lighter at the horizon. The sky is something you can watch every day. Then you can paint your clouds over a dry sky or paint wet-on-wet. Keep the clouds big, at the top of the sky and smaller, in the distance. A grey can be mixed using Cobalt Blue, a little Crimson and a very little Raw Sienna. Usually a cloud is darker on the bottom and the shape is usually on the top. European painting skies were often seen as associated with the heavens the air and, to be a theatrical backdrop providing deep space for the pictureâ€™s subject. The clouds are lightly shaded in the center and brighter on the top edges. The shapes are rounded, repetitive and, the clouds appear more as symbols of clouds than observed. Clouds are used for drama, theatrical back-lighting, and "chiaroscuro"
Two artists stand out for the representation of the sky and clouds. John Constable .It has bee said that there is always a cloud in the sky. JMW Turner painted skies that were the subject of the painting itself. Bothe marvelled in the sky as Monet did the water. Skyscapes, generally painted at sunrise, often on the spot, and very nearly abstract, are closer to the sublime than anything in art.